THIS SOUNDS LIKE A STRANGE "DOCUMENTARY." My comments are interspersed. A two-part documentary series that traces the beginnings of Christianity, REVELATION, premieres on Maori Television this Sunday March 12 at 4.30 PM. Acquired from Southern Star International for broadcast on Maori Television, the documentary series starts in the sixth century, 1000 years before the birth of Christ, when the Jews of Palestine were forced into slavery. The sixth century (BCE, I assume) was not 1000 years before the birth of Jesus. It was the 500s. I'm not sure what the "forced into slavery" bit is about. The Babylonian exile maybe? But they were exiled, not enslaved. From the mystery that surrounds the secretive burial and discovery in 1940 of the Dead Sea Scrolls to the formation of the Roman Empire, REVELATION examines the reign of terror that saw many Palestinian women commit suicide in mass protest. 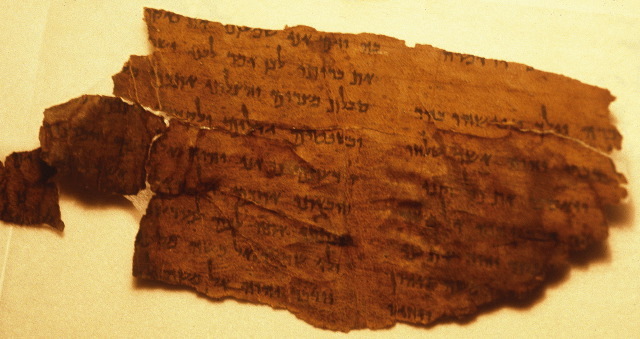 The Dead Sea Scrolls were discovered in 1947, not 1940. I don't know what the "reign of terror" and the suicidal "Palestinian" women are about and I don't feel inclined to speculate. The documentary attempts to prise apart the beginnings of Christianity from its Judaic past to its church of all nations present. Here, it seems, we come to the agenda of the film. However, the beginnings of Christianity are not prisable apart from it's Judaic past, so the attempt isn't likely to get very far. If this press release reflects the quality of the production and some producer actually paid good money to make it, they were ripped off. Cairo - In the wake of global controversy over publication of cartoons depicting the Prophet Mohammed, an Egyptian film producer has announced the first Arab-made film project detailing the life of Jesus Christ. A central theme of the film, which is projected to cost far more than the average Egyptian production, will be the holy family's flight to Egypt, producer Mohammed Ashub told Deutsche Presse-Agentur dpa in Cairo on Monday. The Simon Wiesenthal Center may relocate Muslim graves discovered on the Jerusalem site of its planned tolerance museum in hopes of soothing Muslim anger, a spokesman said Monday. Durgham Saif, a lawyer for the human rights group Karameh, which is involved in the court case, said he did not know about the plans to relocate graves but said moving them would not satisfy the group's demands. "We have criteria that there is no way to build anything on the cemetery," Saif said. "It's a holy matter." But according to media reports a parking lot had already been built over the proposed site of the Wiesenthal Center in the 1980s. Plus a hotel was built over another area of the cemetery in the 1920s, approved by the Grand Mufti of Jerusalem at the time. That doesn't decide this case either way, but I don't find Durgham Saif's argument here persuasive. This paper explores the relationship between the Hekhalot literature -- the pre-Kabbalistic corpus of mystical texts that give instructions on how to ascend (or "descend") to God's heavenly throne-chariot and to compel the angels to grant revelations -- and the verifiably Jewish apocalypses of the early centuries C.E. and earlier. The article views the Hekhalot literature from the heuristic social-scientific model of the practitioner (the "descender to the chariot") as "shaman/healer" and examines the apocalypses to determine which elements of this model already existed in the earlier period and whether these indicate a genetic relationship between the apocalyptic visionaries and the descenders to the chariot. The social-scientific model is the one presented in my book, Descenders to the Chariot: The People Behind the Hekhalot Literature. You can read an early version of the thesis of the book in my 1994 SBLSP article, "The Hekhalot Literature and Shamanism." RECENT CAVE EXCAVATIONS in the Dead Sea region have uncovered some important coins from the period of the Bar Kokhba revolt. I've probably covered this before, but I can't remember (and I'm unexpectedly in Edinburgh this weekend and kind of busy). This is a Netscape News report, found via last week's Explorator. When Israeli archaeologists began excavating caves near the Dead Sea, they found a real treasure: nine rare silver coins that are believed to date back to a failed Jewish rebellion against the Romans in the second century A.D.
UPDATE (6 March): Yep, I had posts on it here and here almost three years ago. NAZARETH, Israel -An Israeli couple, joined by a young woman reported to be their daughter, entered one of Christianity's holiest sites on Friday and set off a series of small explosions, sparking a riot that left six people wounded in this Arab town in northern Israel. The family's motives were unclear, but police said they had been treated for psychiatric problems in the past and faced the possibility of losing custody of their children. Although the attack did not appear to be nationalistic, it underscored the tensions between Israel's Jewish majority and its Arab minority. Israeli Arabs, who make up about 20 percent of the population, complain of systematic discrimination. Police said the three entered the Basilica of the Annunciation Friday evening and set off firecrackers and other small explosives. Church officials said the site was unguarded, and witnesses said the explosives were hidden in a baby stroller. The church is at the site where Christians believe the Angel Gabriel appeared before the Virgin Mary and foretold the birth of Jesus. Nazareth, the boyhood town of Jesus, is inhabited by Christian and Muslim Arabs, and religious tensions have boiled over in the past, with the two sides in a dispute over attempts to build a mosque next to the church. This was really playing with fire and it's fortunate that it didn't turn out even worse. On the fringes of uptown's CIAA festivities, Carolina Voices tucked itself away in St. Peter's Episcopal Church: near in location, but far removed in spirit. The choral group paid homage to the Dead Sea Scrolls, a few of whose fragments were right next door in a show at Discovery Place. MADONNA is trying to buy a house overlooking the Sea of Galilee at the place where followers of her Kabbalist faith expect the Messiah to reappear to herald world peace. Representatives of the 47-year-old US singer have been cold calling home-owners in the picturesque mountain retreat of Rosh Pina and offering to pay any price to secure a property on her behalf. Yedioth Ahronoth said that the owner of a 100-year-old, ramshackle five-bedroom villa overlooking the Sea of the Galilee had been recently contacted several times by representatives of the superstar with a view to selling his property. According to the same source, Madonna wants to renovate the building into a center of study of mystical Jewish texts pored over by Kabbalah followers. If the rumor is true, I imagine this will be good for tourism. Completely overlooked in the current media frenzy about building the Museum of Tolerance atop the millennium-old Ma'amun Allah Cemetery is the site's forgotten history as the killing field of 614. In that year, nearly three centuries of prosperity under the Byzantine empire were shattered by Persia's Sassanid Shah Khosrau II, known as Parvez - the Victorious. Local Jews together with their co-religionists in Babylonia allied with the Zoroastrian invaders to defeat the Christian rulers. Seeking revenge for generations of persecution, the Jews destroyed hundreds of churches and monasteries. "Once Jerusalem was in Persian hands a terrible massacre of Christians took place, and the Jews are accused of having taken the lead in this massacre. It would not be surprising if the accusation were true, even though the fantastic stories told of Jewish revenge by Christian chroniclers are certainly exaggerated." How many Christian prisoners of war were murdered by the Mamilla Pool? A precise number is of course now impossible to verify, but Israeli archaeologist Ronny Reich puts the tally at 60,000 before the Persian military stopped the carnage. The quotation is from historian James Parkes. I took this picture this morning. 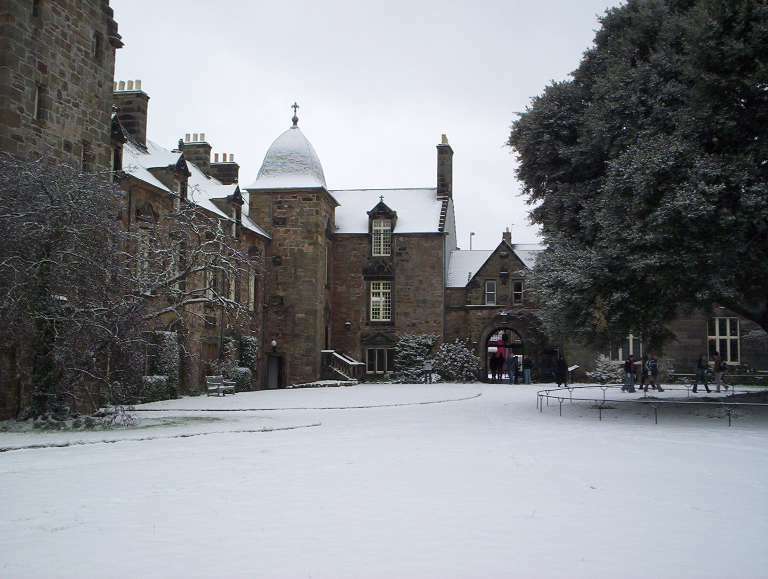 We don't get much snow in St. Andrews, but much of what we do get comes in the first half of March. According to tradition, the thorn tree on the left was planted by Mary Queen of Scots. Dutch newspapers are reporting the death yesterday of Gilles Quispel (May 30, 1916) the Gnostic scholar and emeritus professor of Early Christianity at Utrecht. He died of pneumonia, reportedly in an Egyptian hospital. For information about him, see the Dutch Wikipedia, where his death is also reported. Professor Quispel was almost 90 years old. And as I noted here recently, another renowned specialist in Gnosticism, R. McL. Wilson, just celebrated his 90th birthday. It seems that Gnosis is good not only for the soul, but also for the constitution. THOUGHTS ON ANTIQUITY, Chris Weimer's blog, has moved. You can find it now here. Torah, Bible and Qur'an : "In the long history of l'homo religiosus," writes the curator in the catalogue to the exhibition Livres de Parole: Torah, Bible, Coran (Books of Speech: the Torah, the Bible and the Qur'an) currently at the Bibliothèque nationale de France in Paris, "monotheism is a recent development, bringing about a veritable revolution in the relationship between the gods and man." NEW YORK — An expert on ancient Egyptian texts is predicting that the Gospel of Judas— a manuscript from early Christian times that's nearing release amid widespread interest from scholars — will be a dud in terms of learning anything new about Judas. I'm glad the press is getting this message out a little more clearly. Irenaeus said the writings came from a "Cainite" Gnostic sect that jousted against orthodox Christianity. He also accused the Cainites of lauding the biblical murderer Cain, the Sodomites and Judas, whom they regarded as the keeper of secret mysteries. You can read the passage by Irenaeus at the Gospel of Judas page over at Peter Kirby's Early Christian Writings website. It remains to be seen whether Irenaeus' Gospel of Judas is the same as the Coptic one. In The Secrets of Judas, a HarperSanFrancisco book on sale April 1, Robinson will describe secretive maneuvers in the United States, Switzerland, Greece and elsewhere over two decades to sell the "Judas" manuscript. Emmel got a glimpse of the text but didn't know it was the Gospel of Judas till years later. He was told the original asking price was $10 million but it could be obtained for $3 million, an impossibly high figure for the interested Americans. (ANSA) - Palermo, February 28 - An ancient Phoenician temple unearthed in Sicily is "unique" in the West, the head of the Italian dig team claims . "You have to go all the way to Amrit in Syria to find a similar one," said Lorenzo Nigro of the Rome University team . Motya - whose name means "wool-spinning centre" - was founded in the 8th century BC, about a century after the foundation of the most famous Phoenician colony in the ancient world, Carthage in Tunisia . DA VINCI CODE REVIEW: I finally got around to reading The Da Vinci Code last fall. (I borrowed Grant Macaskill's copy, which he had bought from a charity shop, so both of us avoided the defilement of giving Dan Brown money.) The book has been in the news a good bit lately because of both the lawsuit and the upcoming movie. I've finally finished this brief review, which is so late that it's timely again. Warning: there are some spoilers below. Unfortunately, Brown fails to follow this principle of administering his fake scholarship in small doses relieved by vigorous bouts of action. Rather, pages 304 to 367 or thereabouts consist of nonstop pseudo-intellectual drivel and well before I got to page 367 I was longing for Silas to burst in and shoot them all down so they would shut up. The Da Vinci Code is a novel and therefore a work of fiction. While the book's characters and their actions are obviously not real, the artwork, architecture, documents, and secret rituals depicted in this novel all exist (for example, Leonardo Da Vinci's paintings, the Gnostic Gospels, Hieros Gamos, etc.). These real elements are interpreted and debated by fictional characters. While it is my belief that some of the theories discussed by these characters may have merit, each individual reader must explore these characters' viewpoints and come to his or her own interpretations. My hope in writing this novel was that the story would serve as a catalyst and a springboard for people to discuss the important topics of faith, religion, and history. BUT DOESN'T THE NOVEL'S "FACT" PAGE CLAIM THAT EVERY SINGLE WORD IN THIS NOVEL IS HISTORICAL FACT? If you read the "FACT" page, you will see it clearly states that the documents, rituals, organization, artwork, and architecture in the novel all exist. The "FACT" page makes no statement whatsoever about any of the ancient theories discussed by fictional characters. Interpreting those ideas is left to the reader. This isn't correct. For example, he has the Dead Sea Scrolls containing "Gnostic Gospels" and calls the Scrolls "Christian records" (p. 351). Kindly show me a Gnostic Gospel among the Dead Sea Scrolls. I don't want to belabor the historical inaccuracies in the book here, since they've been covered very thoroughly many times elsewhere. But for more information see here and here and here and here and here and here and here and here. The bad thing about the book is that many people will read it and think the ridiculous claims in it are true -- and Brown himself is partly to blame for this and he could have mitigated the problem instead of making it worse. The good thing is that it has gotten a lot of people interested in the Bible and in actual ancient Jewish and Christian history and that may lead some of them to learn more from reputable sources. Plus, it's an amusing read. BIBLICAL STUDIES CARNIVAL III is out over at Rick Brannan's Ricoblog. DID Pepin the Fat assassinate King Dagobert II in AD679? Why did the Knights Templar fall out with the Priory of Sion in 1188? And was the Crucifixion a fake? Early Christian history dominated the second day yesterday of the hearing in the High Court into whether the American author Dan Brown had infringed copyright by lifting ideas from a book published more than 20 years previously for his blockbusting fiction, The Da Vinci Code, written in 2003. Michael Baigent and Richard Leigh are suing their publishers, Random House, for breach of copyright, saying that Brown took at least 15 core ideas from their non-fiction work, The Holy Blood and The Holy Grail, written in 1982. It was the turn of the defence yesterday to deny the claims and, as ever, the devil was in the detail. At this stage Mr Justice Peter Smith interjected from the bench. “It’s not surprising, given what happened in 1187.” The court was briefly silenced. “The loss of the kingdom of Jerusalem, thanks to their stupid master,” the judge explained. Knowing nods all round. Right. 1187. Of course. This judge seems to be the right man for the job. This then must be the dilemma for those who seek to defend their own versions of made-up history: they can only sue and win if they can demonstrate that their ideas are fictional, invented and therefore entirely their own property. If, on the other hand, they succeed in proving that their research is genuine, and their investigations firmly based, then they have made a signal contribution to history — a history that belongs to us all. Their revelations become as public as the secrets of the Enigma Code, the Suez pact, or the British presidency of the European Union. Be watching for the big splash surrounding "The Last Cato"
(http://www.thelastcato.com/) [out in March/April] a DaVinci Code knock-off that features a Vatican paleographer-nun, the Coptic archaeologist with whom she falls in love, and a high placed Swiss Guard with a dirty secret all plumbing the depths of the Staurofilakes (keepers of the True Cross) theft of holy relics by following the secrets hidden in Dante's "Purgatory". Having just finished an advanced copy, while the storyline is on par with Brown's book as far as readability, the author's confusion over the relationships between classical, Koine, and Byzantine Greek is obvious. A few wild theological interpretations of NT theology and early church history will also no doubt create a wide array of "The Truth Behind the Last Cato" books. Too, when the key historical text of the Staurofilakes is found by our heroes in a basket of cast-off manuscripts ready to be burned at Santa Katrina a la Tischendorf, informed readers will chortle with delight. Assuming the horrific errors in Greek case endings are edited out in the final edition along with transliterated rather than translated geographic names from the Italian original, "The Last Cato" makes an enjoyable, although eye-rolling, late night read will pump new life into Dante's flea-bitten soul. ROME, Feb. 27 (UPI) -- Roman Catholic theologians say that the "Gospel of Judas," a version of Christ's life from the point of view of his betrayer, has no effect on theology. SANLI URFA (known in antiquity as "Edessa"), the city that gave us the Syriac language, has its own newsletter, the Urfa Times. The current issue has a brief article on the city's history. Reveal Yourself my Dearest, And spread over me Your canopy of peace. Let the earth shine with Your glory, Let us rejoice in You. Make haste, my Love, for the time has come; Show me Your favor as in the days of old. My father is a professor of piyyut, Jewish liturgical poetry. For years my family and I joked with him that no more than maybe three and a half people had ever read any of his books. We liked to needle him that while all of his buddies in the academy got invited to all kinds of public events and lectures and were interviewed by the media, he had chosen such a bizarre field of study that no one would ask him to speak anywhere, except for, maybe, the ones that had absolutely no choice. Even us kids never made it very far past the dedications on the first page. At an event three months ago celebrating the launch of the new website Invitation to Piyyut I understood that something had dramatically changed in how the Jewish community, at least in Israel, relates to this complex, beautiful and little-understood art form. What is the piyyut?. The term is derived from the Greek word "poietes" meaning "creator." Using this definition the classical midrashic collection Leviticus Rabba honored 3rd century sages Rabbi Eleazar and Rabbi Shimon by calling them "poietes" – "creators." During the period of Late Antiquity and onward, as the much of Jewish poetic writing became related in some way to synagogue worship, the term piyyut came to mean a Jewish liturgical poem specifically. With the revival of Hebrew as a spoken language in the 19th century, the definition of piyyut received a more general meaning, namely any type of written expression in high, classical language. Sometimes the word piyyut even described any expression that was particularly moving or artistically profound. Contemporary proponents of piyyut tend to define it as liturgical poetry that is actually sung. Thus the word "paytan" – or one who "creates" a piyyut – refers both to the writer and/or composer of a piyyut as well as the actual singing performer of a piyyut.